[PDF] The Industrial Organization and Regulation of the Securities Industry (National Bureau of Economic Research Conference Report) | Free eBooks Download - EBOOKEE! Description: The regulation of financial markets has for years been the domain of lawyers, legislators, and lobbyists. In this unique volume, experts in industrial organization, finance, and law, as well as members of regulatory agencies and the securities industry, examine the securities industry from an economic viewpoint. Ten original essays address topics including electronic trading and the "virtual"stock exchange trading costs and liquidity on the London and Tokyo Stock Exchanges and in the German and Japanese government bond markets international coordination among regulatory agencies and the impact of changing margin requirements on stock prices, volatility, and liquidity. This clear presentation of groundbreaking research will appeal to economists, lawyers, and legislators who seek a refreshingly new perspective on policy issues in the securities industry. 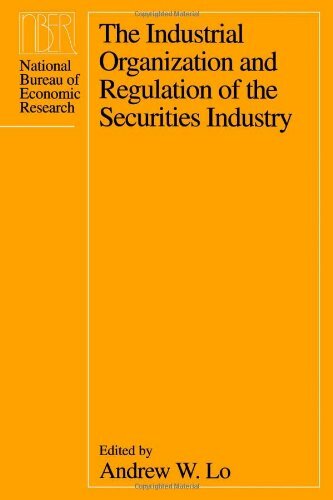 No comments for "[PDF] The Industrial Organization and Regulation of the Securities Industry (National Bureau of Economic Research Conference Report)".